the multiple conditions using AND as outlined below. Wondering if you have examples already that can be shared to review. Please note that Query tested with single condition and works. Thanks for posting question to this forum. Here we have two filters, one for the incident id, and one for a custom field called qradar_id. Two points here. 2. Make sure you use the correct data type for the "value". Also you can easily try this on interactive page (Help->Interactive REST API). Also, in general it is better to use the query_paged endpoint. 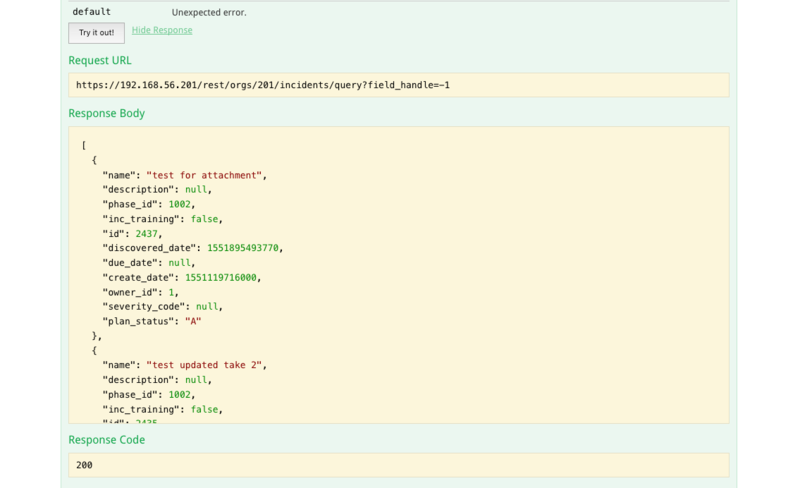 The query endpoint pulls all the incidents which could be huge. 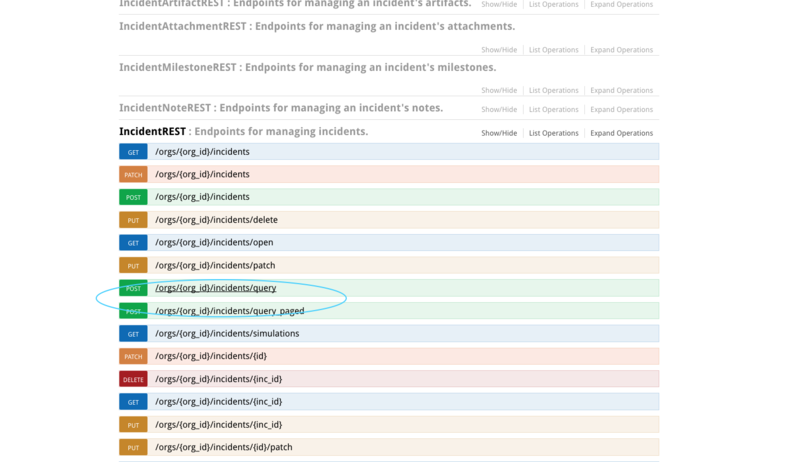 The query_paged endpoint gives you better control. What is the URL para ejecutar the query? I need to do something similar for a BI board. One easy way is to use our Interactive API (Help/Contact->Interactive REST API). Then go down and click IncidentREST. The URL is shown there. You can try the REST API directly here. Look at the example I gave below. The "filters" is a list of dict, not a dict. I have tried it and it works well with some fields, but I generate a field of type "selection" and it is not working for me. So go ahead and omit it. Unfortunately, for a select field, you will need to specify the "id" of the value and not the name. 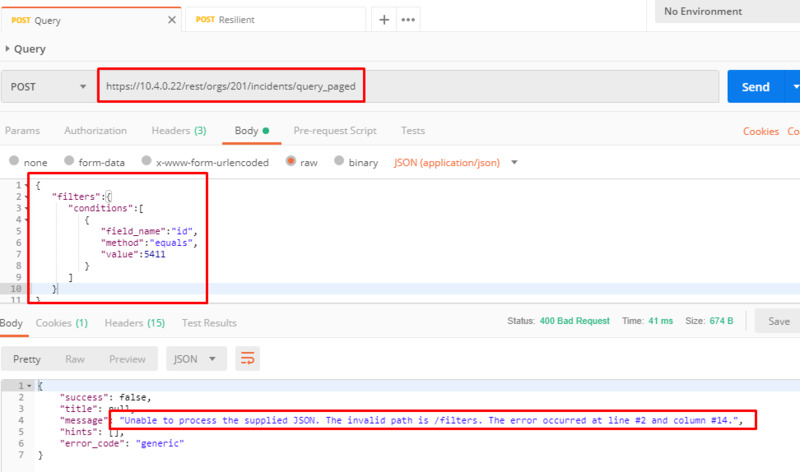 You can lookup the "id" of your custom field value by accessing the Types REST endpoint. and look at the "values" list. Excellent, it worked perfectly. I had not noticed that the ID should be used as it is a selection field. Is it possible to make a condition by "between" dates? How would the date format be? Yes you can. The Resilient UI uses the same Resilient REST API. So any conditions you see in the UI you can achieve using the REST API as well. Again, these values are in milliseconds, so make sure you use that. In the code sample I pasted above, those times translate to Jan 1 and Apr 1 of 2019. Hope this is helpful! Good luck.